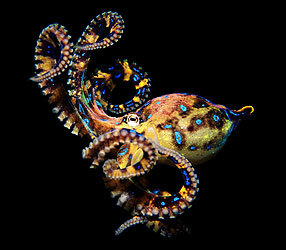 The blue-ringed octopus may be one of the world’s most infamous cephalopods. It’s just the size of a teacup, but it packs a potent poison that can paralyze and kill a person in hours. There is no known antidote. In NATURE’s Encountering Sea Monsters, one of the world’s leading octopus experts introduces viewers to the delicate mating dance of this deadly resident of the South Pacific. 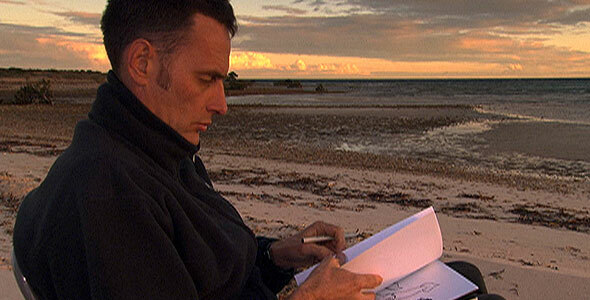 His name is Dr. Mark Norman, and he’s a senior curator at Museum Victoria in Australia. Dr. Norman is the author of the leading global guide on cephalopods and has played a role in discovering or describing more than 100 new species. As part of his work, Norman has scuba dived in some of the world’s richest coral reefs, crewed expeditions that have hauled specimens up from deep trenches and submerged mountain chains, and explored tidal pools brimming with life. “It’s perpetually interesting and, basically, just a tremendous amount of fun,” he says. NATURE Online recently spoke with Dr. Norman — this time in his office. How did you become such an expert on all things tentacled? Well, back when I was a doctoral student in the late 1980s I was looking for a subject, and cephalopods seemed pretty interesting. It seemed like everywhere we looked there were new species, and somebody needed to describe them all. Exactly how many kinds of cephalopods are there? We don’t really know. But if you count all the squids, ocis (octopods), and the nautilus, so far there are probably well over 1,500. We were massively underestimating before. I mean, we’ve gone from something like a dozen species in Australia alone to more than 75, and there are probably more. Is it hard to find new species? Sometimes. Some of these things are little pygmy animals, very small, so you can understand why they haven’t been noticed before. But some of them are two feet wide, bright red monsters that move around under crowded city jetties. Just nobody bothered to look before. So it’s been a lot of fun. Do you have a favorite kind? Probably the pajama squid. It’s a little round guy, looks like a peppermint the size of a golf ball, with black and white stripes. Hides in the sand by day, comes out to feed at night. They’re just wonderful. Is there anywhere in the ocean you can’t find a cephalopod? Not really. They go from really deep water — they’ve been reported down to 7 kilometers (4 miles) deep, and I suspect they go deeper — to right up to the coast. They live in really warm and really cold water. It seems as long as the water’s got salt in it, they’ll get into it. What do you like best about these animals? I guess the idea that they are fairly vulnerable and still survive. I mean, they don’t have shells, except for the nautilus. They are a very nice meal walking around without bones. But they use very complex behaviors to survive. They live off their wits to avoid predators using mimicry, color change, and camouflage. They’ve spent 500 million years learning how to escape detection or capture. It makes them inherently interesting. And they are skilled predators. Oh, yes. They are excellent hunters, very capable. The only plant eater I’ve heard about was an octopus in New Guinea observed eating a banana. But generally they are super carnivores that grow fast and die young. The exception is the nautilus; they can live 20 or 30 years. What direction are your studies moving in these days? I’m excited by the chemistry of these animals. They appear to produce a lot of interesting and exotic compounds for hunting and for defense. So we’d like to figure out what they are and how they work. What did you think of those first pictures of the giant squid that the Japanese got? Spectacular. I love the idea that there are still monsters of the deep.